In this excerpt from the new book The Sorcerers and Their Apprentices, author Frank Moss examines the CityCar project and the difficulty of turning an idea in a lab into a product that changes a market. In the dead of night about a week before Christmas 2009, members of the Smart Cities group quietly pushed a car out of their second-floor workshop of the brand-new Media Lab building, into the freight elevator, and down to the lower-level atrium for its first test drive. This was the first demo of the working prototype of the CityCar, the project that had consumed the past three years of their lives. PhD student Will Lark had the first crack at the remote control, and when he first commanded the car to move forward, it lurched so quickly that it would have crashed through one of those glass walls had one of the students not grabbed and braked it from behind. The second attempt went more smoothly, though, and soon Lark and fellow PhD student Raul-David “Retro” Poblano were passing the remote back and forth as they took turns moving the car through its paces–forward, backward, and sideways. Meanwhile undergraduates Tom Brown, Charles Guan, and Nicholas Pennycooke were helping PhD student Ryan Chin make repairs on the fly. Screws needed to be tightened; a few wires needed to be cut. The power level on the wheels needed to be adjusted so that they would have enough torque to move easily along the smooth marble floors. When a wheel started to fall apart, Chin hastily patched it together. He didn’t have a choice; there were no spares. When they embarked on the CityCar project, Mitchell and his Smart Cities students were determined to tackle the “wicked problem” of traffic choked, polluted urban environments by developing radically new modes of personal mobility for cities. The wheel robot invention was the first step, but it was only the beginning. The next step was to build fully functioning working prototypes of the car and ultimately to conduct real-life pilots in cities. In other words, it wouldn’t be enough to just invent the car of the future. To achieve true innovation, they would have to come up with a way to put it to use. Just as the wheel robot was only part of the City Car design, the design of the vehicle itself is only a piece of the group’s plan to solve the “wicked problem” of urban congestion and pollution. They must think not only about the invention of the vehicle itself but also about how it will fit into the greater context of the city and urban life–how it can be used to create an entirely new system of personal transportation that provides the benefits of mass transit while still preserving the freedom and flexibility of personal forms of transportation like cars, bikes, and scooters. After all, cars in cities are parked 95 percent of the time, and 85 percent of cars have only one occupant. That’s a lot of empty cars. The team’s thinking was influenced by existing vehicle sharing systems, like the Zipcar network in the United States and the world’s largest bike sharing system called Vélib in Paris, which validated that these systems could work. They wondered if they could learn from them and do it better. As a result, they are designing a shared-use system they call Mobility-on-Demand (MoD). With MoD, you would be able to pick up a CityCar at one location and drop it off at any of hundreds of recharging stations strategically placed near bus, train, and subway lines. Picking up a car would be as easy as renting a luggage cart at the airport. Just swipe your credit card or ID at the charging station and drive away. A GPS tracker system would also prevent theft and vandalism, problems that have plagued Paris’s bike rental system and others like it. The group’s big vision is of a synchronized, networked transportation system so well coordinated that there are always enough cars in the right place at the right time. To accomplish this, they will have to design an urban nervous system that could monitor the car’s usage and traffic patterns and use sophisticated algorithms to predict demand at different points in the city at different times of day, while at the same time controlling supply to heavily trafficked locations, to avoid bottlenecks. For example, when a particularly packed train of commuters pulls into the station during morning rush hour or when hoards of Red Sox fans descend upon Fenway Park for a night game, the system will know how to reallocate and redistribute the cars so there’s the right number of cars on hand and traffic will flow smoothly and without disruption. Such a system should also implement dynamic pricing–perhaps rentals would be more expensive on rainy days, to encourage carpooling and reduce congestion–as well as electric charging infrastructure that minimized energy consumption. In time the system could even navigate the vehicle without any effort from the driver and even integrate with other urban networks to provide fun personal services, like recommending nearby dining, shopping, and sightseeing. If widely implemented, it would totally change our concept of urban mobility, and it would be a huge step toward making the cities of the world more livable and sustainable. Chin and his Smart Cities colleagues seem to be in a state of perpetual motion these days–overcoming obstacles one at a time, trying to turn the City Car from a clever invention into a profound innovation. 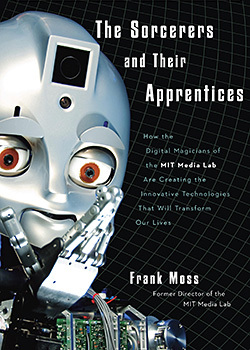 Excerpted from The Sorcerers and Their Apprentices by Frank Moss © 2011 Frank Moss. Reprinted by permission of Crown Business, an imprint of the Crown Publishing Group.